"Sonic the Hedgehog and Tails!" Sonic the Hedgehog 14 is the fourteenth issue of the Sonic the Hedgehog comic series. It was released in September 1994. 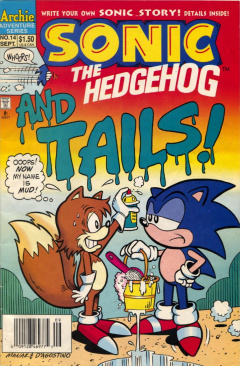 This comic features three stories: Tails' Taste of Power, "Do-It-Yourself" Sonic, and Girls Just Want to Have Fun. In a greenhouse, Sonic is trapped in the vines of a sentient plant. Tails, noticing him in trouble, flies over to save him. As he arrives, Sonic is kissed by the plant, a passion flower, and tells Tails he's fine. He gets released from the plant's grasp and asks Tails if he wants to take over something for him. Tails responds preemptively, thinking he wants him to take over as leader of the Freedom Fighters, but rather he wants him to finish watering the plants in the greenhouse. Sonic leaves the area, leaving a hungry Tails sulking while he waters the plants. Looking up, he notices one of the plants is bearing fruit. Later, Sonic leads Rotor Walrus to the greenhouse, telling him he left Tails to water the plants. They enter as they see that all the plants in the greenhouse have grown significantly, which Tails takes the responsibility for. He tells them that he created a new plant food, while stating a complex mathematical equation that leave Sonic and Rotor confused. While Sonic tries to leave, Rotor asks Tails how he knew so much about plants. He holds up the remaining core of the fruit he saw and ate earlier, saying he came up with the equation while eating it. Rotor panics and runs over to the Mobian tree of wisdom he was growing, which had the only apple he could ever grow on it that Tails ate. Rotor, having nurtured it for quite some time, comes to the conclusion that, by eating the apple, Tails has become a genius. After coming up with this conclusion, Antoine runs into the greenhouse in a panic. While out on a scouting mission with Sally and Bunnie Rabbot in the high weeds, they were ambushed by Dr. Robotnik's Shredbot. Sonic runs out to help them. In the high weeds, the Shredbot (a giant walking robot with arms with saws) is chasing down Sally and Bunnie. Sally becomes exhausted, but just as she and Bunnie stop, Sonic arrives to save the day. Before he can start his work, Tails flies in, saying he'll take care of the robot instead. He taunts the Shredbot by flying in front of it. It brings its saws toward him to take him out, but with quick thinking, flies away, causing the saws to rip into each other. He comes down to the others, while Sonic is curious how Tails was able to move so fast. Tails explains so in a long description that nearly knocks Sonic out of the panel. A confused Sally asks Tails what he means, to which Tails replies that he is the obvious replacement for leader of the Freedom Fighters. He takes off, ordering the rest to join him. Back in Knothole Village, Rotor announces that one of Robotnik's creations has entered the base and is trying to capture him: a humanoid robot with vacuums for hands. Sonic goes to destroy it by doing a Sonic Spin, but rebounds off of it. Tails walks over and tells him that the robot is his own creation, the Vacubot, and that Sonic can't destroy it, nor can Robotnik detect it. With some excess metal, Tails also made a medal for himself with the number '1' on it to show off his leadership. Sally walks over, trying to convince Tails that leadership isn't just about being smart, but about being courageous and to have experience. Ignoring Sally, he decides to convince the rest that he is a leader by taking down Robotnik himself. In Robotropolis, in Robotnik's base, Snively reports to Robotnik of a living being approaching the area. Robotnik demands that the creature be caught and roboticized, but Tails isn't making the job easy, avoiding the guards and getting through security with ease. Snively is able to identify Tails, who is still wearing his 'number 1' medal. Robotniks orders all back doors and entrances sealed, but is too late to order it when Tails arrives in the lair behind Robotnik's seat. Tails demands Robotnik surrender his empire to him, but suddenly becomes very dizzy and has difficulty completing his statement. Robotnik says he would be happy to surrender, but asks Tails to take a few steps forward. Tails, who has come to from the dizziness but still confident, steps forward and is grabbed by two robotic arms. In the meantime, Rotor is investigating the fruit that Tails ate while Sonic is looking in a dictionary to determine what Tails meant by 'subduing our prime nemisis[sic]'. Through his investigation, Rotor determines that the effect of the fruit is temporary up to 24 hours and that he should be back to his old self. Sonic has finished looking through the dictionary and has determined that Tails went out to stop Robotnik. He runs off without warning Rotor to help aid Tails. In a few split seconds, he is able to arrive at Robotropolis and enter Robotnik's lair through a jammed-open door. Tails is still trapped in Robotnik's lair, with Robotnik about to activate his roboticizer. Sonic bursts into the room, warning Robotnik that activating the roboticizer will mean an end for everybody in the room. He goes to Tails' side and tells Robotnik that Tails was sent on a death-defying mission to destroy Robotropolis, even if it meant his own end. He rips off Tails' 'number 1' medal and states that he was going to do it with their new hidden mega-ton explosive. Robotnik is sceptical and orders Snively to scan it. After scanning the device, Snively can't detect anything in the medal and thinks he may be telling the truth. Sonic prepares to throw down the medal, counting down from 5, demanding he release Tails. Initially, Robotnik thinks he's bluffing, but as he counts down, he becomes more nervous. When he reaches 1 and prepares to throw it, Robotnik breaks and releases Tails. He and Snively then run out of the room in fear of the explosive. Tails asks how he knew Robotnik would fall for the trick, in which Sonic tells Tails that he is a coward. They return back to Knothole, with Sonic leading the way. With Tails back in Knothole, Antoine gives him an hour long lecture on following leaders. Bored out of his mind, Tails looks over to see his 'number 1' medal. As Antoine turns his back toward Tails, he throws the medal at Antoine. He freaks out, thinking it is still a bomb, and jumps onto a light on the ceiling. Everybody, except Antoine, enjoy a laugh. With the writers on vacation, Sonic has been left in charge of scripting the next three pages of the comic. He asks the readers to submit their dialogue for the speech bubbles of the three pages as part of a contest. Sonic is on a boat with Tails, fishing. Robotnik, meanwhile, is spying on the duo in a submarine with Crabmeat at the helm. Tails is able to catch a small fish, while Sonic makes a big catch: Robotnik's fish submarine. Robotnik opens the large mouth of the submarine and brings Sonic's small boat in. He closes the mouth to crush the two, but Sonic, using his super speed, paddles the boat away. He leads Robotnik to the shore, and jumps the boat over a rock onto the beach. Robotnik continues to follow and hits the rock and land, destroying his submarine. Later on, Tails takes a photo of Sonic as he shows off his catch: Robotnik's submarine. He tells the reader to fill in all the blank spots on the three pages and to send it to Archie comics, where the 2 winners will receive subscriptions to Sonic's comic. A bored Robotnik decides to play around with some defective Freedom Fighter talking string puppets of Bunnie Rabbot, Sonic and Sally that tell female stereotype statements. Stating that girls just want to have fun, he gets an idea, just as Snively walks in. He quickly hides the toys in his drawer, stating that he's plotting and scheming as usual. Snively, with Crabmeat, ask what his latest master plan is. Rolling out a large mural of Sonic, Sally, Bunnie and Rotor, he states that although they are great as a team, they are weak as individuals. He rips Sonic off the mural, and with the other heroes out of the way, he should be able to take care of the rest of the Freedom Fighters. Later that day at night, in the Great Forest, Bunnie and Sally see a number of spotlights in the distance. They follow the spotlights and find a mall. They decide to enter and do some shopping, with Snively watching nearby. Just as they enter, a trapdoor opens and they fall into the mall basement. In another room, Robotnik watches everything with his security cameras and decides to see the two girls with Snively. The two are held by Swatbots as Robotnik enters, telling them they are going to be bait for Sonic. Bunnie jokes around, while Sally declares that they can take care of themselves without Sonic. They both turn on their Swatbot guards and easily dispose of them. More Swatbots enter, but the two girls are able to defeat them without a sweat, as Robotnik watches in shock. With the job done, they both high-five and turn their attention to a nervous Robotnik. They tie Robotnik, Snively and Crabmeat together in rope and joke how they look pretty. Despite being 'bad', they decide to give them back the Sally and Bunnie talking dolls, but with a few corrections. Powerless to do anything, the dolls sit near the tied-up group, stating pro-female comments. The girls walk out of the mall, Bunnie punching one of the sale signs, and return to Knothole. As they return, they see Sonic cutting some coupons out of a newspaper. He states he's clipping coupons for the new Mobius mall's game cartridge sale. The girls walk by, laughing, stating that men only think about fun, games and shopping. Sonic looks at the reader, confused. Robotnik's base in this issue, and subsequent issues, takes up the style of his base from SatAM. Page 11 of Tails' Taste of Power has a spelling error. Nemesis is first spelled as Nemisis, but is spelled correctly later in the page. The Sonic-Grams section corrects an error made in issue 11, where one story is missing credits.